This lovely bouquet brightens sandy soils in early spring. Look for the long narrow onion leaves (one to four per plant) that mark the spot where the flower stalks will soon emerge. The noted 19th century botanist and teacher, Thomas Nuttall, collected this plant on the banks of the Missouri, probably in 1811. 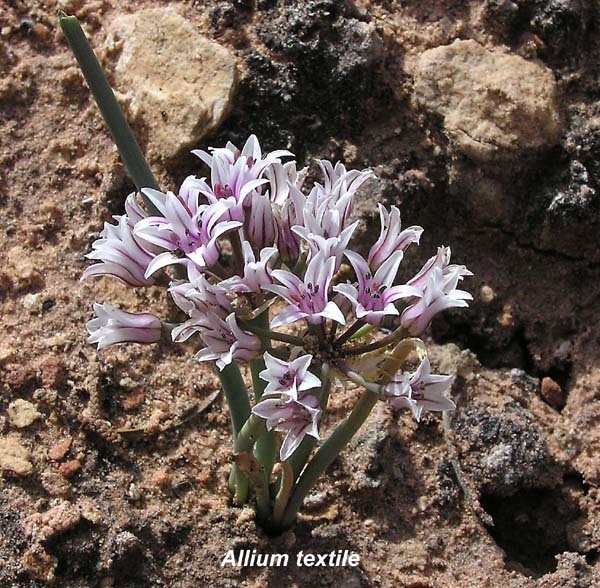 He named it Allium reticulatum in 1813 and it was renamed Allium textile in 1913 by Aven Nelsen and James MacBride. "Textile" refers to the fibrous, textile-like tissue around the bulb.